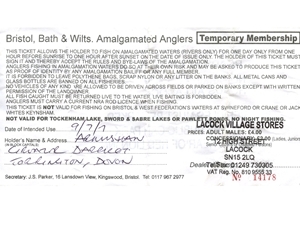 The Bristol, bath and Wilts AA used to run the fishing on the Bristol Avon at Laycock where this day ticket was issued. By 2014 it had become Amalgamated Fisheries Ltd. If you can add any additional information, we would be glad to hear from you.